1. What are patents and its advantages/objectives? Answer: Patents are techno-legal documents providing the details of new, non-obvious, and industrially applicable inventions. Once approved by the patent office of a certain country/region, the patent provides the patent owner legal rights of monopoly/ right to exclude others from using, -selling, offering for sale, importing – the patented invention in that country or exporting the patented invention from that country. If however, a third party flouts the legal rights of the patent owner (infringement) he/she/they can be sued in court of law for injunction and/or damages (compensation). 2. 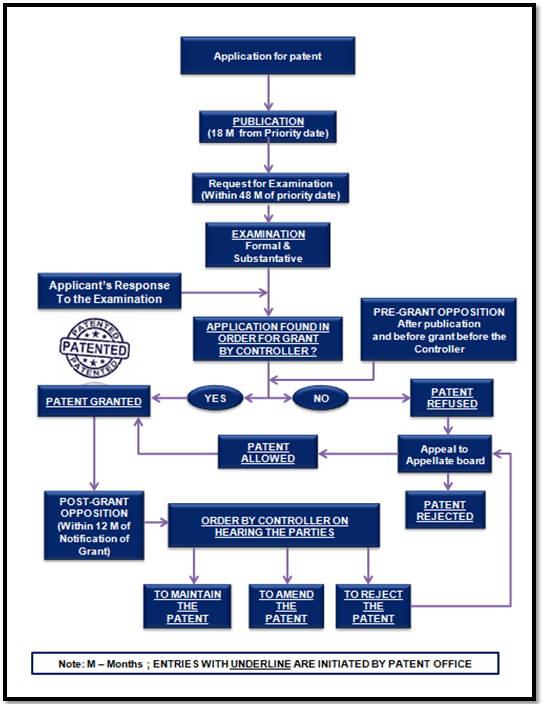 What is the application process for a patent? The date of first filing of a patent application is called the priority date. In the patent system of first to file, this date becomes important and if there are two patents/ patent applications with same/substantially similar subject matter, the earlier priority date patent application/patent survives the other. If filing has to be done in other countries, the priority of the initially filed application (parent application) -can be taken and filed in respective countries/regions. The subsequent applications shall have the same priority date as the parent application and are referred to as family members of the initial application and each other. The application process is generally similar but the format of application may differ from country to country and the applicant ordinarily cannot file without professional assistance of a patent agent or attorney in that country/region. 3. What is the difference between provisional and complete specification? Answer: A complete specification is the regular patent application which is prosecuted, examined, accepted and granted by the patent office. The complete specification comprises of the full and sufficient disclosure of the invention along with the best mode of working of the invention and definitive claims enabling the legal boundary of the invention. However, the patent law makers understood that sometimes when the invention is conceived but not fully developed providing a complete specification is not practically possible and hence they introduced the option of a provisional specification. A provisional specification is required to give only the key novelty and inventive aspect of the invention in an abridged form and may not have claims provided. 1. A complete specification has to be filed within 12 months from the date of filing provisional; else the patent application shall lapse. In some countries, like India, there is an option of post dating the 12 month period by pushing forward the application date of the provisional but the same is not recommended as the patent system follows a first-to-file priority of patents. 2. Provisional patent specification filing is optional and voluntary. An applicant can also file a complete specification directly without filing a provisional specification. 3. Even though the provisional specification does not have claims, it creates a legal boundary of the invention with respect to the novelty and inventiveness, and the complete specification cannot be broader in scope compared to the provisional. Hence provisional specification also requires careful drafting. 4. More than one provisional applications can be combined to form a single complete specification – in case provisional specifications were filed in respect of cognate inventions or where one was modification of other. 4. What are the steps involved in patent registration in India and timelines associated with it? – Filing of the patent application is the first step of the patent registration. – Patent office then publishes the complete patent specification ordinarily after eighteen months from the priority date. Optionally a request for early publication can be made whereby publication happens ordinarily within one month of such request. – The next step in the process is examination by the patent office. Unlike publication, examination of the patent application is not automatic and request has to be filed within 48 months from earlier of date of priority and filing of the application. -Once request for examination has been made, patent office issues examination report to the applicant. Examination of the application is done based on the date of filing of the request for the examination i.e. earlier the request made for the examination, earlier is the report issued. – After the issuance of first examination report, application is to be put in condition of allowance within 12 months by waiving the objection and complying with requirements, if any. – After considering replies to the first or subsequent examination reports and hearing notices if any, controller grants or rejects the patent application. -In India, patent application can be opposed before and after grant of the patent. Patent can also be revoked under some circumstances. After grant of the patent, renewal fees have to be paid to keep the patent in force. – An appeal can be made against the decision of the patent office/controller at the Intellectual Property Appellate Board by the aggrieved party. 5. When can a phrase ‘patent applied’ or ‘patent pending’ or ‘patented’ be used? Answer: ‘Patent applied’ or ‘patent pending’ can be used with any article sold when patent application has been filed to cover that article and application is not yet granted/rejected/withdrawn/abandoned. Patented or patent can be used with any article sold when patent has been granted which covers the product. Unauthorised use of these words can lead to fine extendable to one lakh rupees. 6. Is there a way to add improvements or technical modifications to a patent? Answer: Ordinarily no new matter can be added to a complete patent specification. However, in such cases there is a provision of filing a patent of addition in respect of – original patent of application, and thereby claiming through the patent of addition improvements or modification to the invention. Reader is further advised to click here for an interesting and knowledgeable article on patent of addition. 7. What are the modes of filing a patent internationally? Paris Convention: Direct filing in another country is facilitated through Paris Convention for all members of the convention which includes India and all major countries. However, the filing through Paris convention has to be done within 12 months from priority date. 8. Are there any restrictions in filing outside India for Indian residents? – If an application is filed in India, then there is a mandatory waiting period for at least 6 weeks before filing outside India, else a request for Foreign filing permit at the patent office must be submitted and only after getting the permit can the filing be done outside India. – If the applicant wants to file directly outside India, without filing in India first, then again, a request for Foreign filing permit at the patent office must be submitted and only after getting the permit can the filing be done outside India. Failure to take permission from IPO before filing of foreign application can lead to abandonment of the Indian Patent application and if granted, then revocation of the patent. One might even face imprisonment up to 2 years or fine or both. 9. What is the relevant date from the infringement perspective? Answer: Although suit for infringement can only be instituted after the grant of patent, patentee shall have privileges as if patent was granted on the date of publication of application, and when suing for infringement the patent owner can sue backdate and claim damages from the date of infringement or publication of patent application whichever is later. 10. When does the applicant have to pay any annuity/ maintenance/ renewal fees for the maintenance of the patent? Answer: The annuity/maintenance/renewal fees need to be paid only after the grant of the patent in India but in the form of accrued payment for every year right from first 2 years out of 20 years of term of patent. According to section 53 (2) of the act, renewal fees needs to be paid in order to keep patent in force at the expiration of 2 years or subsequent years from the date of patent which shall be renewal fees for the third year or subsequent year. It means that maintenance fees needs to be paid in nth year in respect of nth plus 1 year. According to section 142 (4) of the act, where a principal patent is granted later than 2 years from the date of the filing of the application, the fees which have become due in the meantime may be paid within a term of three months from the date of the recording of the patent in the register or within the extended period not later than nine months from the date of recording. This system however varies from country to country. 11. What is the term of the patent? Can a patent be renewed once it is expired? Answer: Generally throughout world, term of patent is twenty years from the filing date in case of domestic patents, and it is twenty years from the date of international filing date in case of national phase applications entered through Patent Cooperation Treaty (PCT). Some countries also allow patent term adjustment in case of delay from the side of patent office in grant of patent and patent term extension in case of delay from the side of regulatory bodies in case of pharmaceutical and agricultural patents. In India, no patent term adjustment or patent term extension is granted. Once term is expired, patents can’t be renewed. 12. Who may file request for examination and what is time allowed for putting application in condition of grant? Answer: The request for examination may be filed by the applicant or any other interested person, or their agents. Ordinarily, the first examination report (FER) is sent to the patent applicant and is also uploaded online for public perusal. Once the examination report is issued it is obligatory on the part of the patent applicant to respond to the FER or subsequent ERs if any, within twelve months from the date of FER issue to the applicant with the aim to put the application in order for grant. 13. Is it possible to file pre-grant opposition even though there is no request for examination filed? Answer: Yes, it is possible to file representation for pre-grant opposition even though no request for examination has been filed. However, the representation will be considered only when a request for examination is received within the prescribed period. As representation for pre-grant will be considered only when a request for examination is received within the prescribed period, one can choose to file request for examination as ‘any other interested person’ so that one does not need to wait till applicant files request for examination. This will help to expedite the process and decide the fate of patent application. 14. Can patent be opposed even after the grant of the patent? Or can patent be revoked the grant? Answer: A patent can be opposed even after the grant. There are different grounds available under section 25 (2) of the Patents Act, 1970. Grounds of section 25 (2) can be used to oppose patent within period of 12 months from the date of publishing of the grant of the patent. Section 64 of the Patents Act, 1970 can be used to revoke the patent. Unlike the grounds available under section 25 (2), grounds available under section 64 can be used till the expiry of the patent. Decision of the controller in the post-grant opposition can be appealed and such appeals shall be made within three months from the date of communication or receipt of the order of the appeal. Condonation of delay petition along with necessary fees can also be filed with genuine reason of delay. According to section 64, patent may be revoked on petition of any person interested or central government or patent may be revoked by high court on a counter-claim in a suit for infringement of the patent using one of the grounds of section 64. 15. What is patentability search and is it mandatory? Answer: It is the search done to find out whether a particular invention is patentable or not. In this search, study is done to check whether or not a particular invention meets all three criterias of patentability i.e. novelty, non-obviousness and industrial applicability. Considering the costs involved in the patent registration, getting this search done from professional patent consultants who use paid and non-paid databases, search patent and non-patent literature from all over the world can save lot of cost if invention turns out to be non patentable during the search. However, if one is confident enough of the patentability of the invention, this search can be skipped and patent application can be filed directly.